Yesterday, CHQ Chairman Richard A. Viguerie released a letter to conservative leaders calling upon them to speak out in support of embattled White House Senior Advisor and Chief Strategist Steve Bannon. “The campaign against our friend and fellow conservative Steve Bannon has reached a fever pitch, and it is urgent that you join me in letting President Trump know just how deeply it would divide his winning coalition if he were to cave-in to those who wish to derail his agenda by removing Steve Bannon from the White House staff,” wrote Mr. Viguerie. “Since the first day they joined the Trump campaign there have been two people we conservatives could rely upon to share our ideas and values and take our concerns and issues directly to Donald Trump: Kellyanne Conway and Steve Bannon,” noted Viguerie. Mr. Viguerie’s letter pointed out that since the day he was appointed Senior Advisor and Chief Strategist to President Trump, Steve has been under constant attack; lately the attacks and smears have reached a fever pitch with almost daily leaks that "Bannon is on his way out." While President Trump recently pushed-back against the attacks on Bannon saying, "I like him. He is a good man. He is not a racist. I can tell you that… He is a good person. He actually gets a very unfair press in that regard," President Trump also reminded everyone that he was successful in the Republican primaries before Bannon joined his campaign. "We'll see what happens with Mr. Bannon. He is a good person and I think the press treats him frankly very unfairly," President Trump concluded. If our goal of governing America according to conservative principles is to be accomplished we must not allow that to happen. Whatever your views of President Trump's candidacy were prior to the election, we conservatives must recognize that his presidency is our best hope for defending American exceptionalism and sovereignty against the forces of globalism and stopping and reversing America's slide toward socialism. 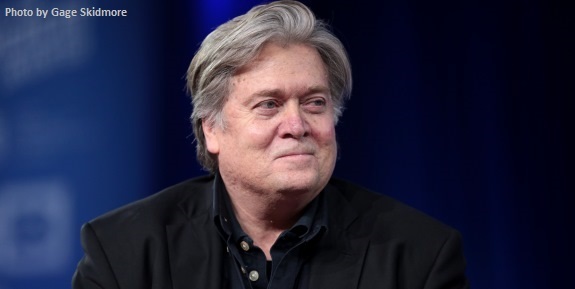 We know President Trump instinctively shares many of our views and we also know that Steve Bannon is one of the few people among the President's senior staff who can be relied upon to encourage and reinforce those instincts and help the President turn them into policy. In order to prevent the start of a complete purge of conservatives from the White House staff we need to build a groundswell of support behind Steve Bannon. We invite CHQ readers to use their channels to send the White House a message similar to the one in our column by posting to your blog, website or email list, calling talk radio, writing an op-ed or by contacting the White House directly. You can call the White House comment line at 202-456-1111 or contact the White House through this link or contact President Trump through Twitter at @realDonaldTrump or @POTUS . Time may be short to get this message through to the President, so we urge you to act today.